Amy Moore is a postdoctoral researcher in the Transportation Planning and Decision Science Group at ORNL. 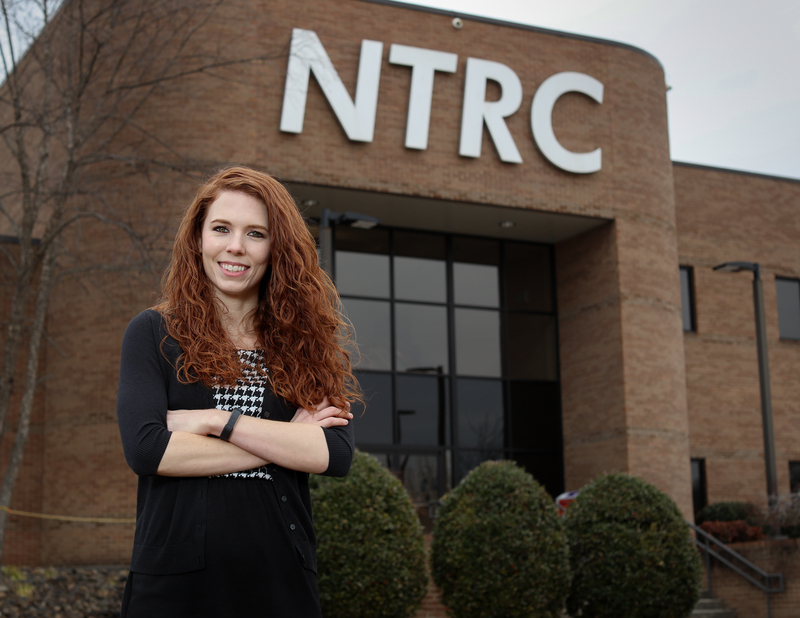 June 13, 2018 – Amy Moore has found that her pursuit of several degrees and certificates in a variety of subjects is serving her well as she uses her expertise in transportation planning, geographic information science, and information technology to develop intelligent mobility solutions at ORNL. The transportation systems engineer is working as a postdoctoral researcher in the Transportation Planning and Decision Science Group, where she’s figuring out the most energy-efficient methods for last-mile freight delivery in an urban area (hint: it’s not drones). “I only mentioned drones in a transportation research conference presentation recently, and suddenly I became the drone girl,” Moore said. Drones are getting a lot of attention these days, but seem more suited for reconnaissance or for delivering medical supplies in remote areas than for delivering goods in urban areas, she added. Moore is the principal investigator of a project in which global positioning units were installed on delivery trucks in Columbus, Ohio, and the resulting data (minus any personal information) is being used to calculate routes and methods that achieve the greatest energy savings. The key goal of intelligent mobility research is to apply data and technology to help move people and goods more quickly, cheaply, and efficiently. The data is helping Moore model “truck tours”—or freight movement from central depots to final delivery in neighborhoods, and back. The goal is to compare energy and time savings among the various routes and methods for final delivery. The use of electric delivery vehicles (EVs) or customers using EVs to retrieve packages from centrally located pickup lockers are efficient means in urban areas, according to Moore’s work. Moore has always had an interest in freight and transportation. For her family it was dinner conversation—her father spent his career managing facilities for trucking companies. Moore has always had a passion for learning that was instilled by her mother, an elementary school teacher. She earned a B.S. in psychology from Georgia State University and developed an interest in planning as a career during an internship with the Henry County, Georgia, government. She later earned a master’s degree in public administration at the University of North Georgia. 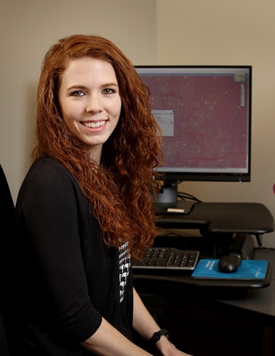 Once she decided to narrow her focus to transportation planning, she earned a master’s degree in geography and a professional certificate in geographic information science (GIS) from Georgia State University. Moving on to the Georgia Institute of Technology, Moore earned master’s degrees in civil engineering and city and regional planning. While pursuing a PhD in civil engineering, she also earned a professional certificate in information technology. She is now putting all that knowledge and her boundless energy to work not just on intelligent mobility, but also on projects such as calculating the energy efficiency of passenger vehicle fleets and analyzing risks associated with pipelines. Moore and her husband —a PhD student in history at the University of Tennessee, Knoxville—were ready to leave the Atlanta congestion behind in favor of East Tennessee as Amy pursued a postdoc position. Here, they enjoy hiking in Tennessee’s state parks and being close to the Great Smoky Mountains National Park. Part of Moore’s motivation lies in a personal ethos of energy conservation. “I enjoy looking at new ways to conserve energy. I like trying to recycle as much as I can, for instance, so I’ll leave a smaller footprint,” she said. “In that respect—figuring out how to use less—my life and my research are in line with each other.